If you follow me on Twitter or BT, you know I bonked on my long ride last Sunday then broke a spoke and called the SAG wagon. I dropped my wheel off Sunday at my LBS and didn't get it back until Friday (after calling Wednesday and again Friday). I love my LBS, but the service is either immediate or a little slow. Good excuse for buying some new wheels and making these a back up :-). Anyway, I had two rides planned during the week and no road bike. 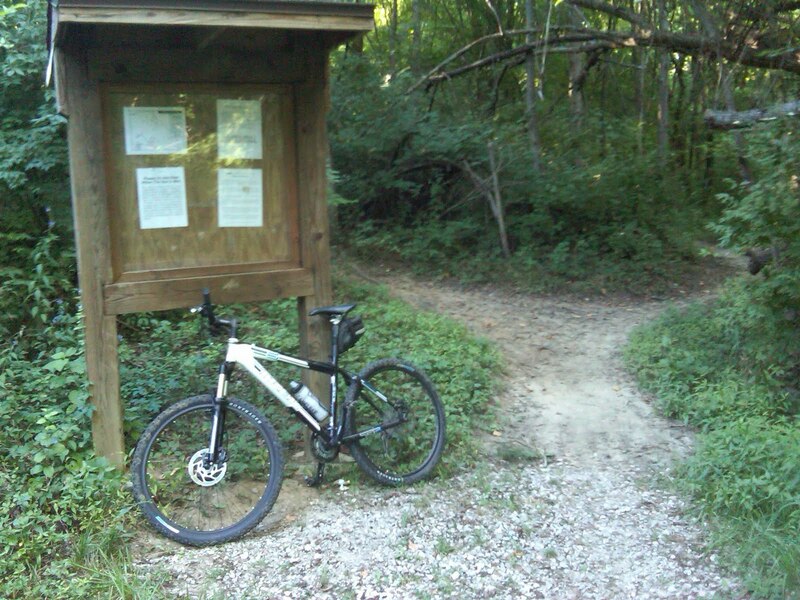 Perfect excuse to dust off the mountain bike and hit the single track. 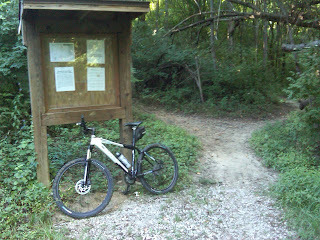 We have some great trails just 10 minutes from my house that were built by the Gateway Off-road Cyclists . Years ago, I use to bike off road a couple times a week and loved it. I hadn't ridden my mtb for a few years and actually looked forward to it. When I started the ride, I felt like I was riding one of those Harley choppers with really tall handlebars and sitting straight up. Totally different than a roadie with aero bars. I made it out to the trails and took a few pics. My off ride bike handling skills and confidence are gone. I kept my shoes unclicked in 90+ percent of the time. It didn't help that I saw no one on either ride. It was actually kind of spooky. The vegetation was pretty thick and touching both my legs at several places. I'm surprised I don't have poison ivy already. I used to get it routinely back when I went off road routinely. Brings back memories. Back in the late 90's a friend and I would bike after work on an abandon trail (that has now been revived by GORC) in Highland Illinois. We strapped bow saws to the back of our bike frame and when we came across a downed tree, we would clear it. One time I had three flats in the span of 5 minutes due to thorns. I was changing/patching tubes while my friend Chris was trying to keep the thousands of mosquitoes flying around off my back. Frantic back then, funny now. ^^^laughing at Julie's post because I do the same thing. Those look like great trails. Agree with Kate about the bugs, ticks are bad this year.